Alright, so this shot was very tough to take. 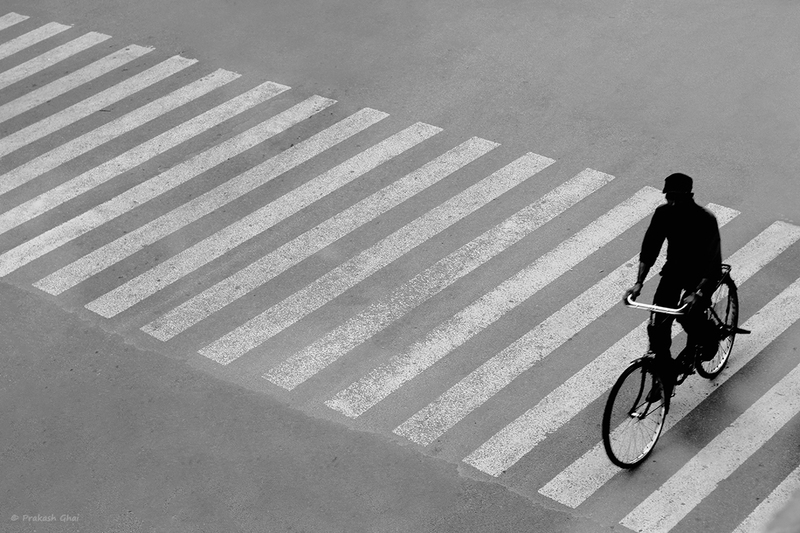 Although I wanted a Man to pass by the Zebra Crossing with an Umbrella in his hand during a rain shower, instead I was happy to keep this shot of a Man riding the bicycle. Monsoons have arrived in India early and I had already planned to take a few shots of people walking in the rain with an umbrella in their hands. Therefore, I first looked for a Coffee Shop at the first floor of a building. So that I can shoot these people "Top-down" from height. Soon, I found such a Coffee Shop and it was quite near to my office. In the morning, it was cloudy and so I decided to take my camera with me to work. I planned that I would sneak out of my office (not photography related) for about an hour, shoot and get back. I even had my own umbrella ready, in case it started to rain before I reached that Coffee Shop. The time was 4 pm and that's exactly the time I take a break from work for about 45 minutes to have my coffee in peace everyday. I walked out from my office. It had started to drizzle a bit and I was OK to walk in that. I reached the Coffee Shop and ordered my Coffee. I told the waiter to deliver my order to the first floor where I would be taking a seat. This Coffee Shop has huge glass windows. Through one of the windows, I could see a traffic signal and the Zebra Crossing near it. I Was on my 50mm prime lens and my Crop Sensor Canon 600D Camera. I was still waiting for it to rain heavily. But the opposite happened instead. It stopped drizzling. So I thought let me just wait a little. But to my surprise, I saw the clouds disperse. I told myself never mind, you can click those umbrella shots some other day. I started to practice framing for my next visit to the Coffee Shop. In one of my practice frames, I placed these Zebra Lines diagonally, just as you see in the photograph above. I was pretty happy with the angle, the distance. I clicked a few empty frames with just the zebra lines in it. Later I waited for unique subjects to pass by. The most common subjects passing by frequently were Cars, Bikes, some Tuk-tuks and of course people walking by. A lot of Bicycles also passed by. Since I have a thing for bicycles, I decided to use that as a subject in my shot. I was just practicing. In one of my shots, I happen to get this man riding the bicycle on the bottom right of the frame. He was exactly on the rule of thirds area of the frame. I also avoided the street traffic here. So, No clutter as well. I told myself, Yes, you got one. This is very Minimalistic. But again this shot wasn't my first priority, as I told you before. b) created a silhouette of the man by adjusting "Levels" in editing. Now, the man is neither too close nor too far in distance. The overall size of the mans shape is also not too big or small enough. The original shot was taken colored. And the shot was falling under the Street Photography category and not Minimalism as Such. On the other hand. If the shot stayed colored, but the Distance in the shot was more or the man on his bicycle looked very small in the frame, then even the colored photograph would have fallen into the Minimalism Category (would still have been street photography as well though). I hope you got the point I am trying to make. I had no idea that I would be writing a Maximalist Blog Post like this to explain this Minimalist Photograph. Anyways let me stop right here and take your leave. Hope that you enjoyed the behind the scenes action/story.